It’s a conversation topic we hear over and over again when we talk to Crestron dealers. Programming Crestron systems is not a quick process, and when you add in customization for third-party devices and changing customer preferences, you end up with programming projects that never seem to end. So I’ve got a challenge for you: Do the math. Calculate how much time your Crestron programmers are really spending on each system from beginning to end. 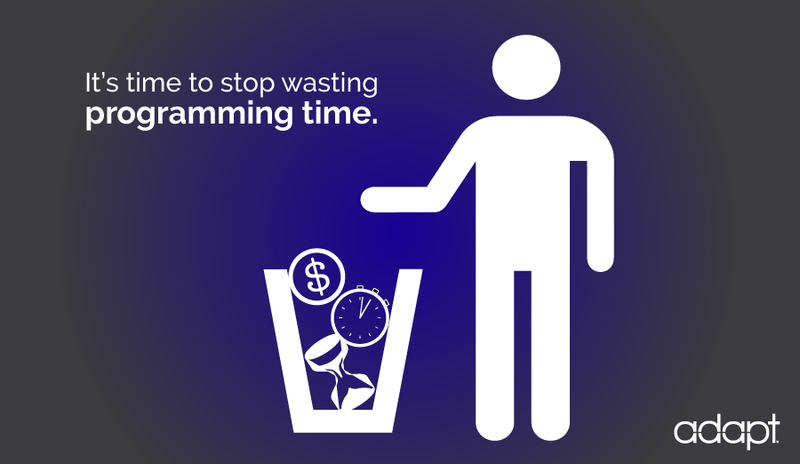 Calculate the value not only in man hours but also in lost opportunities to do more programming. Got that number in your head now? Great. Now imagine cutting it in half. That’s what ADAPT does (or part of what it does, anyway). It’s not just a programming template. It’s Crestron programming software that includes SIMPL Windows modules, a collection of UI templates, and a System Manager tool that allows integrators to customize systems in just minutes. The result is a much simpler, more straightforward way to program fully customized, unique Crestron systems. Systems that might have taken a week of programming previously can be done in a couple of days or less. It frees up programmers to do more systems. But here’s the other neat part: those one-off client requests after deployment? Those requests no longer require programmer involvement. ADAPT’s System Manager software simplifies things so that anyone on the team can make quick changes to the system immediately, drastically reducing support time after install. So here’s the big question: if there is a Crestron programming software that allows you to cut programming and support time in half or more, why aren’t you using it? ADAPT was developed by Crestron programmers to solve this industry-wide issue. And it works. You can check out our success stories and testimonials to see the experience other Crestron integrators have had with this software. We strongly believe that ADAPT is the answer to the common issues facing Crestron dealers, and we’d love to show you more. You can schedule a quick demo of the software here, or you can create a free account and explore it for yourself.